Just recently, I became an Usborne Books Consultant. If you are interested in purchasing books for yourself, your child(ren), or your friends, send me a message. I would love to help you pick out books that you and the child(ren) in your life will thoroughly enjoy. Zackary, my child, has more books than he will ever know what to do with and he absolutely loves reading together. His favorite books include the 'Shine A Light Series' and the 'See Inside Series'. The photo below is of him and his book collection. 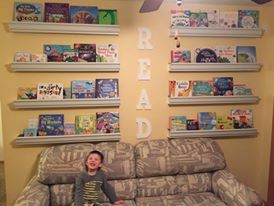 (His books shelves are rain gutters in which we put up in his playroom).